The Imaginary Percussion Ensemble is a chameleon-like entity that grows and sheds limbs; changes colouration, shape, and configuration; and otherwise adapts to the creative possibilities dreamed up by Germaine Liu, Joe Sorbara, and Mark Zurawinski, creative percussionists based in Toronto, Canada who come together as often as possible to share in one another's dedicated, joyous, and seriously playful curiosity around sound-making and musical performance. 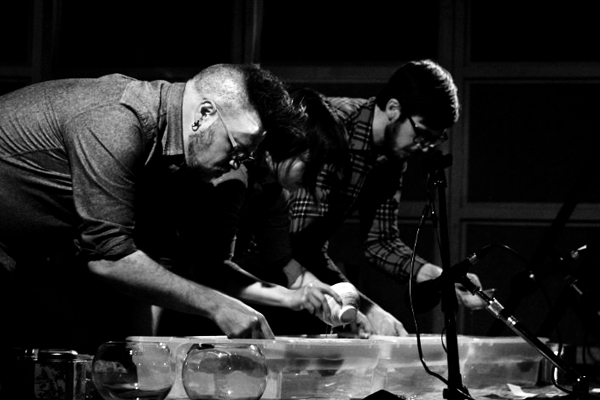 Most recently they performed Liu's unique water music compositions at the twelfth edition of The Music Gallery's flagship event, X Avant. They were also joined by Emily Denison and Anthony Argatoff to play pieces by both Liu and Sorbara at a Somewhere There Second Sunday event in July 2017. 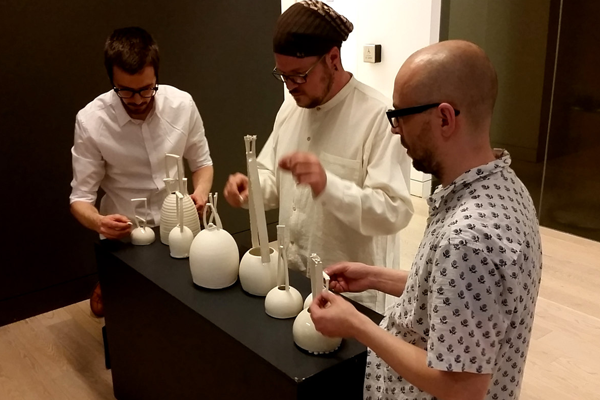 In April 2017, a trio of Sorbara and Zurawinski with fellow percussive adventurer, Tomasz Krakowiak, performed a set of Liu's compositions throughout Toronto's Gardiner Museum, many of them resulting from an ongoing collaboration between Germaine and ceramicist Chiho Tokita. This music was presented again in June at the esteemed Something Else! Festival of Creative Music in Hamilton, Ontario. 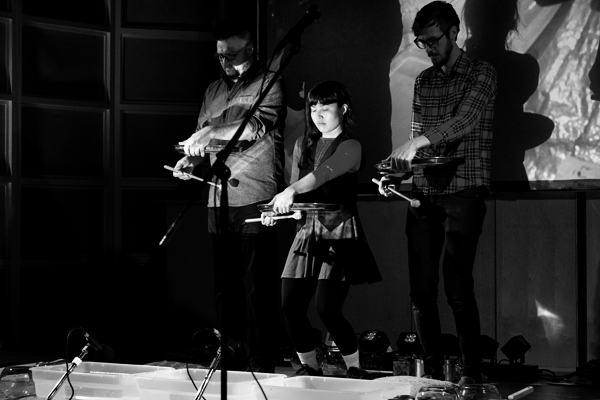 "Over the course of their set, [they] repeatedly challenged any academy-set definitions of just what constitutes an instrument or a musical practice, reaching into the tubs of water at their feet for whatever sounds they required... The ensemble set to work circling the rims of fishbowls with wet fingertips, hammering disorienting gong sounds out of water-set pot lids, simulating rain on tin roofs with foil and tin cans and simply dropping bowls and cups into the water. 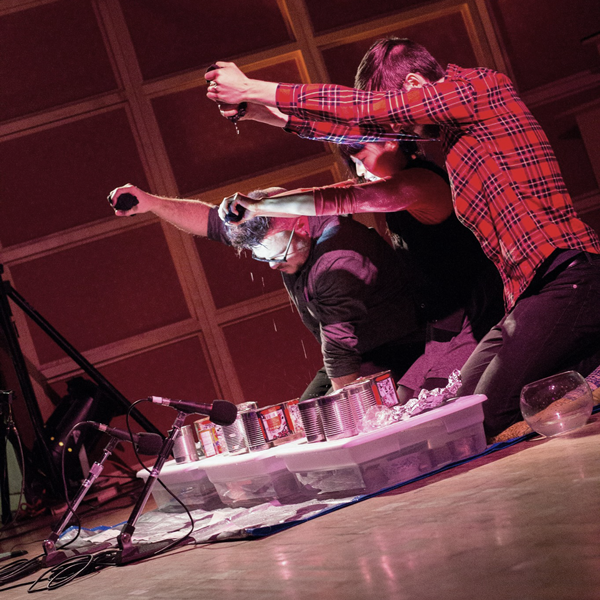 The set straddled a line between creative new music and performance art, frequently earning satisfied laughter and excited applause from the audience."